"Truly D'vine"- more than just a bakery. 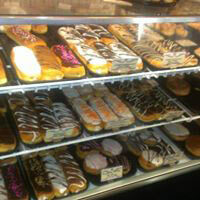 Although we do make our donuts and rolls fresh everyday and you can't stop at just one. We also offer great gifts such as popcorns, jams, jellies, salsas, fudge, candies and more. We offer home cooked meals including lunch specials with fresh fried chicken, homemade mashed potatoes fresh veggies. We make sandwiches to order and have a variety of salads to choose from. We are close to having our pick-up window open, so you can come in or call ahead and pick it up.